PG&E's CEO has resigned, and news reports say the California utility company, facing massive fire liabilities, is preparing for a Chapter 11 bankruptcy filing. PG&E Corp., the San Francisco utility company with nearly 16 million customers in central and northern California, said Sunday its CEO has stepped down, and news reports say it could be notifying its 20,000 employees as early as Monday that it's headed toward bankruptcy in the face of billions of dollars in potential liability for recent California wildfires. The company (PCG - Get Report) announced late Sunday evening that Geisha Williams is stepping down as CEO and has resigned from the boards of directors of both the utility and the holding company. Company veteran John Simon was named interim CEO. Simon has been executive vice president and general counsel since 2017 and has been with the company since 2007. According to published reports late Sunday citing Reuters, PG&E is in talks with some of its lenders about a $5 billion financing package possibly related to a Chapter 11 bankruptcy filing. Under state law, passed only recently, the utility must inform employees of a bankruptcy filing or any change in control of the company at least 15 days in advance, a report in the online edition of the San Francisco Chronicle reported. Pacific Gas and Electric is a subsidiary of PG&E Corp. It filed for bankruptcy in 2001 and emerged from a Chapter 11 reorganization three years later. PG&E Corp., the subsidiary or both could be included in any pending bankruptcy filing, according to the report from Reuters. PG&E could not be reached late Sunday for comment on the report and a company spokesman declined to comment for the S.F. paper. Last week, S&P Global Ratings lowered PG&E's credit rating to single-B, two notches below the investment grade threshold, affecting around $18 billion in outstanding bonds and sending the group's shares more than 22% lower on Wall Street. In November, PG&E warned investors that it faced significant liability over and above its insurance capacity, if its equipment was found to have sparked the deadly Camp Fire that started in the city of Paradise and spread through nearby communities, killing at least 86 people and causing billions in economic and environmental damage. 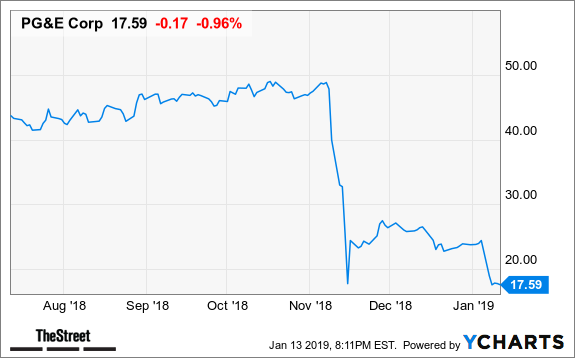 PG&E shares have lost more than two-thirds of their market value since the fire. Customers would not see any interruption in service, and employees would continue to be paid. The Chronicle reported that California Sen. Jerry Hill, D-San Mateo, said he heard on Friday from "someone within our government" that PG&E was getting ready to file the 15-day bankruptcy notice required by law. The story also quoted Hill as saying, "I'm skeptical of just about anything PG&E says or does. What's their endgame? They could be notifying their employees of bankruptcy in order to scare the legislature into taking some action or the state into offering a loan of some kind or a bailout of some kind." Last week, PG&E's board of directors said it was "actively assessing PG&E's operations, finances, management, structure, and governance -- and remains focused on improving safety and operational effectiveness," in addition to the prior actions it had taken to "confront the growing wildfire threat."